Point of sale (POS) is business term used for the spot where a retail transaction takes place, the place where money changes hands. Back in the day when growing up most payments used to be made by cash or check and kiosk owners, shopkeepers and supermarkets stored the money in a cash drawer or box. A new innovation came along – the cash register. First invented in the 1870s, the cash register was a mechanical way to keep track of revenues and was the first POS system. Then came the bar code. Another POS innovation. First launched in in 1974, bar codes began to be stamped on almost all retail items. Merchants used scanners to read these codes and process sales more quickly and accurately. Over the years this became a-must-have technology for retailers and most supermarkets added a few more gadgets to speed checkout lines, including card swipe devices for accepting credit and debit cards. Wireless computer networks, a new technology which could send radio waves through the air to transmit data, was the dealmaker which allowed POS systems to go mobile. In Kenya, mobile networks have proved not only beneficial in supporting mobile communication but also in facilitating mobile financial services as well. On Monday 21st April 2014, Equity Bank announced it will distribute 300,000 NFC-enabled smartphones free of charge to supermarkets, restaurants, kiosks and barbershops as it seeks to boost income from the payments processing business. 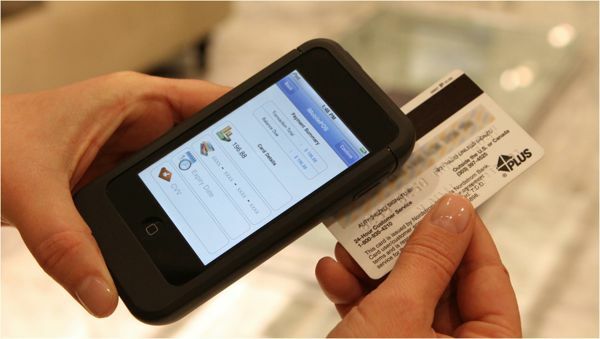 Besides being a crucial tool for retail stores, mobile POS can also be useful especially in collecting cash in the field. As Kenya’s public transport goes cashless by July 2014, Equity has been aggressive in marketing its BebaPay card which allows for a cashless “tap and pay” service for matatu commuters. Equity’s race for a piece of the lucrative retail payments is in stiff competition with Safaricom, which has been issuing M-Pesa pay-bill numbers to retailers under the Lipa Na M-Pesa service to facilitate cashless transactions. Though some have concerns about the security of wireless transactions, both consumers and merchants may benefit from the availability of mobile POS. Retailers and service companies can make employees more productive and lower labour costs. A restaurant, for example, customers and waiters can save considerable legwork with fewer trips to the cash register with payments being made right at the dinner table. Also, accuracy is increased by eliminating written orders. Customers may receive speedier service and error-free, detailed receipts on the spot.